The Nigerian military, in their ongoing mop-up operations in some parts of Borno State, has rescued 178 people held hostage by Boko Haram terrorists. 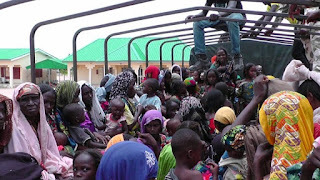 The Deputy Director Army Public Relations, 7 Division, Nigerian Army, Col. Tukur Gusau, disclosed this yesterday, saying that number of those rescued include 101 children and 67 women. “Sequel to the ongoing operations to clear Boko Haram Terrorists in its area of operations, the troops of 21 Brigade in conjunction with elements of 151 Task Force Battalion of 7 Division, Nigerian Army have conducted offensive operations along Aulari in Bama axis,” Gusau said. He also revealed that the troops successfully cleared terrorists’ camp in Fadan, Shuwarin, Wulari, Ngoro Dauye, Jidori, Alikashiri, Kalzamari-Shuwa and Kalzamari-Kanuri amongst others. “During the offensive operations, 178 people held captives by the terrorists were rescued they include 101 children, 67 women and 10 men respectively,” he said. Also, he added, three Boko Haram flags were recovered while five motor cycles were burnt by the troops.